A man remains is still in critical condition in hospital following a crash that led to the M62 being closed for 20 hours yesterday (Monday). The incident happened at 8.15am westbound between junction 21 (Milnrow) and 22 (Ripponden) when a lorry collided with the central reservation. The lorry went through the reservation onto the opposite side, colliding with a number of vehicles. The 37-year-old driver of the lorry was airlifted to hospital and police say he is still critically ill.
Police have issued a witness appeal and requested any CCTV or dash-cam footage. Witnesses should call the Serious Collision Investigation Unit on 0161 856 4741. As a result of the crash the motorway was closed in both directions for 20 hours and police advised motorists to use alternative routes where possible. Highways officials said a cargo of butter in one of the vehicles in the crash turned to grease and affected the road surface. There was also a heavy diesel spill. By 5pm most of the grease had been cleared from the carriageway but the road was not fully re-open until around 4am this morning (Tuesday). John Patrick, a 67-year-old model railway salesman from Pontefract, was left in standing traffic for hours after setting off to meet a friend in Manchester yesterday morning. He said that he hit traffic at around 10.30am and by 2pm had moved only a mile-and-a-half along the westbound carriageway. He said: “There are people using the hard shoulder, they are not service vehicles either. It is absolutely boiling hot here, it is red hot. “I suspect the police are trying to help at the other end but there is no-one around here to help at all. “It is so stressful, there are hundreds of people trapped here all waiting patiently in their cars and other people are driving on the hard shoulder. There is a notice saying drivers should not use the hard shoulder. “The big problem is that once you get onto this section of the M62 there are no turn offs at all. They need to get some emergency turn-offs so people can get off - if a woman was having a baby they would have to get a helicopter. 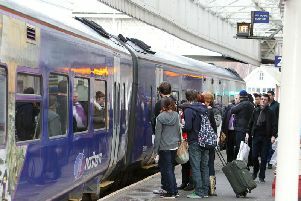 The crash also caused delays on bus services, with services through Calderdale, Huddersfield and Leeds operating up to an hour minutes late. There were also cancellations.